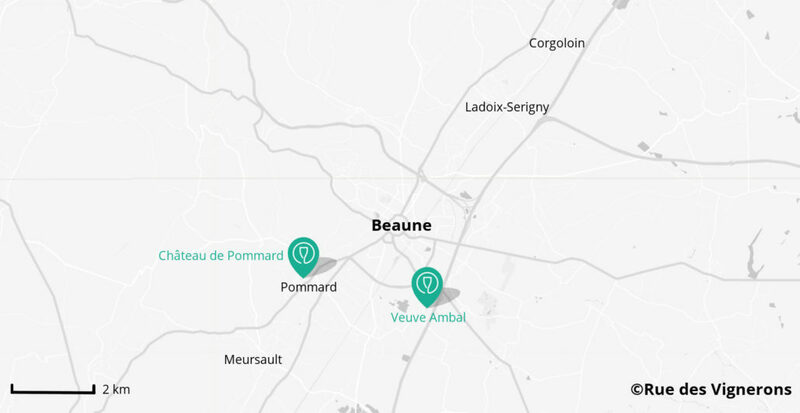 What to visit in Beaune ? Discover here the top things to do and places to visit in Beaune and around the city. Go directly to the section of your choice: Hospices of Beaune, Ramparts, Burgundy wines, Notre Dame Collegiate Church, Halles square, Burdungy Wine Museum, Fine Art Museum, Bouzaise park, Fallot Mustard Mill, The Magical Paths of Light. The Hospices de Beaune are well-known for their exceptional roof with colorful geometric shapes and for their Gothic facades. This building, also called Hôtel-Dieu, was created in the Middle Ages and was at that time a hospital for the poor. It is today a museum you can visit. You will see the rooms where the patients were treated, the pharmacy, the Gothic chapel, the kitchen with vast gothic chimneys… and you will discover a large collection of furniture and tapestries of that time. The hospices of Beaune are also an important wine production site thanks to vine donors. The production is marketed during the most famous wine charity sale that takes place once a year in November attracting buyers from all around the world. The sale profits are dedicated to the conservation of historical heritage and to the improvement of hospital structures. Since the Middle Ages, Beaune has been at the center of wine culture and trade. Take the opportunity to discover and taste the wines of the capital of Burgundy wines. Located in the South of Beaune at 10 minutes’ drive, the Château de Pommard is one of the most emblematic wineries of the region. It produces prestigious wines of exceptional quality including world famous Grand Crus and uses organic agriculture. During your visit, a professional sommelier will help you discover the winery, its beautiful French formal garden and the historical cellar of the 18th century. You will then taste several wines of different appellations. Champagne and sparkling white wines lovers will be pleased to visit the Maison Veuve Ambal. It is the largest producer of Crémant de Bourgogne and has a rich history of more than 100 years. It is located at 10 minutes by car from the center of Beaune. If you don’t have any car, there are also winemakers and wineries in the heart of Beaune. You can discover cellars and taste wines in Domaine Chanson or Maison Jaffelin, two must see wineries. First, the Domaine Chanson is one of the biggest Burgundy wine houses and is a highly recommended step in Beaune. The winery is distinguished by its famous “bastion”, one of the towers of Beaune fortress dating from the 15th century. In medieval times, this tower protected one of the main city gates. Today, it has been turn into a storage place as it houses the wines during their ageing in oak barrels. This incredible and atypical place standing over several floors will certainly impress you during your visit. Moreover, the winery produces wines of exceptional quality. It has a 45 vineyard which is used to produce Grands Crus and in Premiers Crus, following biodynamic principals. The rest of the wines is made through procurement at selected winemakers, allowing the winery to offer a representative range of almost all Burgundy appellations. The Maison Jaffelin is another historical property in Beaune, whose history is closely linked to the one of Notre Dame Collegiate Church. It is indeed in the cellars of this winery that the wines of the Collegiate were kept during Middle Ages. You will visit the historical cellars and enjoy a tasting of 5 to 7 Burgundy wines. The Notre Dame collegiate church, classified as historical monument is a must-see. Mainly built during the 12th century in a Roman style with Gothic additions, it was originally a place of pilgrimage and houses works evoking tales and religious stories. It also houses the 12th century Black Virgin statue and a remarkable collection of 15th century tapestries illustrating the different stages of the life of the Virgin Mary. At night in summer and during Christmas time you can admire light projections, retracing the church history. This lively square is located in the heart of the city. It is dominated by the famous Hôtel-Dieu. Nearby you will find many shops and regional specialities shops (wines, confectionery…) with attractive storefronts. On Saturday morning, a market is set up there where you can buy regional products. For those wishing to deepen their knowledge on Burgundy wine, the wine museum traces the history of vine growing and wine making from antiquity to the 1920s. Modernized in 2017, the museum allows you to discover the terroir and winemaking work through different topics. The rooms layout follows the fabrication steps and all along the visit, interactive animations will surprise the visitor. Following the modernization of the museum, a space dedicated to Crémant de Bourgogne has been opened. If you have time, you can also visit the fine art museum. It is a quite small museum which houses some worth seeing works that will make you discover the rich cultural heritage of the region. Among these works, there is the romantic sculpture « Ondine » of Auguste Préault, the « Four Elements » of the Baroque painter Brueghel de Velours and other masterpieces of Beaune native painters such as Hippolyte Michaud and Félix Ziem. If you want to relax and stroll in the city, go to the Bouzaise Park, located at a few minutes’ walk from the city center. This park is built around the source of the Bouzaise river, very nice to enjoy a little piece of nature close to the city center. The playgrounds, the pedagogical farm and the English garden make it a pleasant place for families. If you appreciate the discovery of wine producers, you will certainly enjoy discovering mustard production. Mustard is not only produced in the city of Dijon. There are also Mustard factories in Beaune, the best known being the Fallot mustard with its ancestral and traditional production method. The Fallot Mustard Mill offers two different tours to its visitors : the Discovery tour, a fun and interactive tour with a modern museum space where the visitor is immersed into the world of mustard with staging effects, lights and sounds ; and the « big thrills » tour that will allow you to discover every stages of mustard seed transformation : from the storage silo to the packaging of the finished product. To extend the experience after the visit, the Mustard Mill has also set up the « Enjoy Fallot » tasting area, where you can discover limited editions mustards. In summer, colourful light animations will give you an extraordinary visual and sensorial experience. Through this night show, you will discover the historical heritage of the city. You just have to follow a luminous marked path that will take you to 30 monuments and fortifications including the 7 emblematic sites of the city: Notre-Dame collegiate church, Hôtel-Dieu, Burgundy wine museum, the Saint-Etienne Chapel, the Belfry, the Mary gate and the rampart “des dames”. We wish you a nice discovery of Beaune and of Burgundy wines! Visit Dijon Discover the best things to do and points of interest to visit in Dijon and its region.